Made this pallet wood wheel barrow planter from Steve Ramsey’s WWMM plans for my Mom’s birthday. My mom is huge into gardening and she is the type that can never have too many planters. At first I made it just like Steve’s plans and left only one slat in the back of the barrow (in pic 4), but then I realized I wanted it to be able to be filled all the way up with soil so I added another slat. I was going to leave it the natural color of the wood but my wifey said it would look better stained, so I went with one thick coat of Cabot red mahogany stain and one solid coat of spar urethane. Mom approved! Pallet projects are cool but man they are a pain in the arse. 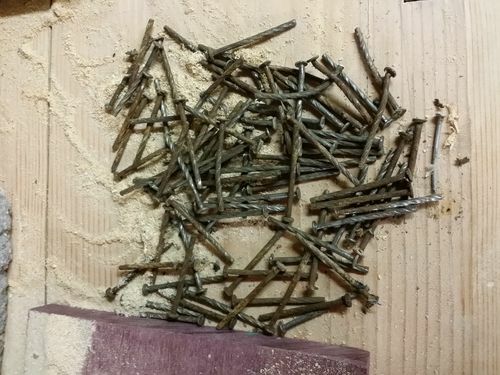 They take for friggin’ ever to get apart, I had a coworker help me weld one of those pallet dismantling tools which helped a ton to take apart, but then getting all of those stupid spiral nails out is just as big of a pain in the A. Also pretty crazy how much that pallet wood shifted and shrunk in just one weekend, it must have been a bit more damp than I thought, there were no gaps in the slats when I assembled it. All in all it was a fun little weekend project. Good job. Looks like a happy rider. Really nice “upgrade”. Sure Mom loved it! (as she should!!!!!) Oh…...... and don’t worry about the shrinkage….. it’s bound to help the drainage once you get the soil and plants in. That looks great! Amazing what beautiful thing can be made out of pallet wood. The picture with the dog in it reminds me of a big Airedale dog we had, every time I’d get the wheel barrel out she would jump in it. She loved to ride in the wheel barrow. He was darn heavy too. Course he didn’t know enough stand towards the front to put most the weight on the tire, oh no, it was toward the back, so I would have to hold up most of his 80 pounds! She was an awesome dog. Very cool project. Big moms is gonna dig it for sure. Oh yes Welcome to the world of working with recycled timber. That’s a very interesting tool ! Where did you get it? Don’t worry about the shrinkage, once you fill it with soil it will close back up again. Foreign objects, make sure you account for all the nails or the next one you find may just be in your trailer tyre ! Pulling pallets apart is better than a trip to the gym!! Robscastle, go to YouTube and search pallet tool or breaking down pallets. I’m sure I saw a video there on making a wood pallet take-it-apart tool. I am going to make one some day, so I did so searching. Beatiful. Love the pallet wood. 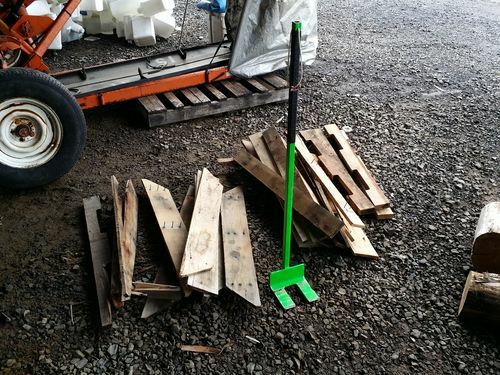 Regarding dismantling the pallets…imagine dismantling 8/4 materials. I had to use a 6ft pry bar to get the slats apart and buy an Airlocker AP700 to eventually get the nails out. If you have an air compressor and do a lot of work with pallets, the AP700 might be a worthwhile purchase. I use it to drive the nails out from the underside (the side with the nail point). Rob-I had a co-worker help me make that tool, like Paul mentioned you can search youtube and google and find them, really simple to make and they work great. Very Nice Project. Well Executed. Thanks For Sharing.